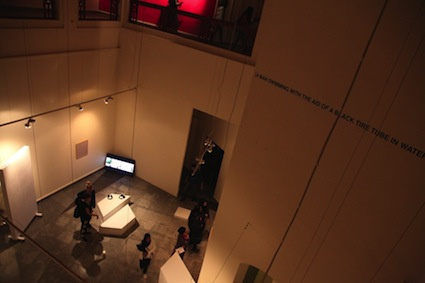 Sharjah Art Gallery, located in the New Cairo campus of the American University in Cairo (AUC), is reached by car approximately an hour and a half out of Cairo’s city centre. Shaking off the asthmatic yellow city, you reach malls, villas, gated and serviced compounds with perfect masonry and conditioned air, surrounded by irrigated, emerald-green gardens. Here those who can afford it buy the quality of life not provided by the deteriorating state infrastructure. With its vast campus of velveteen lawns and food concessions nestled amongst neo-Islamic architecture the AUC is a private university catering mostly to this class. ‘Lost Referents of Some Attraction’, Malak Helmy’s recent solo exhibition there was the result of an invitation extended to the independent Cairo-based art space Beirut to curate a project at the AUC.1 Considering the themes in Helmy’s work, such as desert compounds, sites of leisure and aspiration, and human relations to the environment, the curatorial choice seemed apt to the location. The AUC’s architectural vision was not beneficial to the design of the Sharjah Art Gallery, whose strange octagonal rooms, disorientating sight lines, shiny stone and low-ceilinged upper galleries are a tough proposition. Rather than attempting to ‘master’ or overcome the difficult space, Helmy’s works in the exhibition often employed strategies of diffusion, scattering, imitation and erasure, becoming complicit with its logic. White plinth-like structures in half-hexagon shapes turn out to be echoes of the standard display tables supplied by the gallery; triangular versions are likewise three-dimensional duplicates of sections of the overcomplicated flooring design. 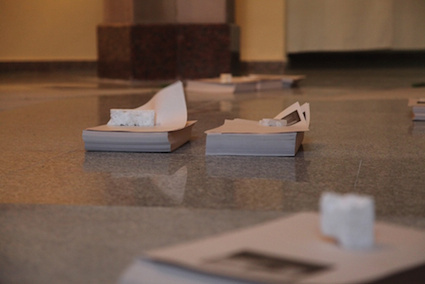 Two of the major pieces – Placeholders (2014) and Statements from the Compound (2014) – are distributed in a serial form through the space, and images are often replaced by words, as though the works are receding from some more solid and unified form. Split across numerous panels, Statements acts as the main thread pulling you through the different rooms of the gallery. Located in the stairwell but permeating the entire exhibition, the 42-minute-long sound work Music For Drifting (2013) likewise linked the spaces together. For this piece Helmy sent a messenger bird equipped with a recording device over various locations in Egypt’s North Coast and Western Desert, including a nuclear plant, the site of the Battle of El Alamein (which turned the tide of World War II) and a desert of glass nodules created from the sand by the heat of a meteor shower over 200,000 years ago. When listening to the edited recording, you mostly hear the wind’s breath, accompanied sometimes by a strange whirring, a distant helicopter, the crash of the sea and duck conversations. It often sounds more technological than natural, like the white noise one hears when travelling in an aeroplane. Helmy argues that the sites traversed in flight were those in which the experience of time has been altered.2 One moment, El Alamein was an unchanging expanse of desert; the next, it was the place where thousands of people met and killed each other in an extremely short space of time. This effect – the changing impression of time that sudden or violent events can bring – is not visually told by these sites; only their aftermath, which subsides to another unchanging form: the still (now glass) desert and the quietly busy nuclear plant. The piece is an aerial survey, but one that refers only to the air and to passing time, not to the land. One [member] uploaded images of the compound … Six claimed the picture as a photograph of their house, two of them were right … Another two were living two houses away, three years apart. The smoothness of the image promotes amnesia. Or the smoothness of the place promotes amnesia. In Helmy’s work, image and place frequently overlap. Or places recede into images, and images recede behind words. 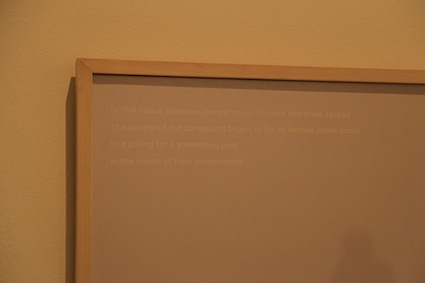 In Placeholders (2014), a series of vinyl text pieces that intersperse the whole show with short descriptions like ‘[HANDS WRINKLED FROM SEA WATER]’ and ‘[A MAN SWIMMING WITH THE AID OF A BLACK TIRE TUBE IN WATER]’. The black lettering ‘stands in’ for photographic imagery, but is rarely placed at eye level – you catch a glimpse of one high up on a mezzanine wall, or placed on top of a room divider. When visual images do appear, they are startling in their intensity. Filmed in the upper-class beach resorts and chemical works of Egypt’s North Coast, the video Records from the Excited State – Chapter 3: Lost Referents of Some Attraction (2012) is presented on a HD screen that fizzles on the retina. While the piece involves non-actors who live in the North Coast, and attempts no narrative or fiction, the work does not feel documentary either. Some elements are staged: a young circus performer twirls a white cube shape against a backdrop of pink salt flats and a searing blue sky; teenage boys sit in a row on the beach, staring at the camera in either boredom or sexual challenge, being pelted softly by bright blue feathers. Whether suspended in puberty, leisure or sheer improbability, the film’s characters seem unconcerned with how little we can reconcile them to their surroundings. These allusions to the place you are standing in and the paper you are reading words on both refer to the viewer’s position and expand into a realm of Helmy’s own making. In the story, a community of compound-dwellers are living ‘(in parenthesis)’ – the absence of movement or aesthetic abrasion in their presumably rather pampered lives making them listless and un-stimulated, lacking in purpose. Forms are reflective and smooth, and memories cannot be absorbed. As the characters sense, this ultimately is a story written in the spaces between image and reality, words and meaning, in the moment before an image can be fixed or a past constructed. ‘There was only the present, the permanent temporary now. / The temperate joy of the compound.’ As a result, they send their youth ‘to the outside / to collect new tags / letters / and keywords’ in order to fend off the inexplicable nostalgia that they are experiencing. Aside from its dreamy evocative beauty, Helmy’s expanded imaginary is critically important. Gulf-style building programmes, desert compounds and gated communities in Arab states in general have long been sewn into a narrative of hubris and catastrophe.4 The kitschy aesthetics of these spaces have tended to be used as moral instruments in the wider political critiques of exploitative labour practices, unfair distribution of wealth and limited political freedom. In ‘The Story of the Story’ (2007), writer Shumon Basar reflected on this as a failure of criticism that insists on a Eurocentric form of authenticity that conveniently shields that same ‘authentic’ from political purview. He paraphrases the common observations: ‘“It’s a theme-park.”/ “It’s all fake.”/ “It’s soulless.”/ “It’s not sustainable.”’5 In other words, these sites suffer from banality on two levels: through their own raison d’être, designed as they are to be as smooth and comfortable as possible; and on the level of their critical reception, which reads them only as the apotheosis of fake. Through focusing the critical gaze on the splashy Gulf aesthetic, a sensational aura is given to issues that when faced in more aesthetically ‘authentic’ spaces, fade conveniently into the background. This silent elision between the sensational and the political underscores many of the hypocrisies of Western populist discussion of the Middle East and North Africa region as a whole. This approach misses the real opportunity, which is to source new critical understandings from the subjectivities existing in the place itself. Basar was writing specifically about Dubai, but a cousin to this aesthetic revulsion can be observed in discussions of the compounds of Egypt and the AUC. The text of Statements acknowledges this tension between the compound-dweller and the observer: I have seen that on the outside their words produce different values of a compound / I don’t know if it’s a problem of values or words. Malak Helmy is a child of the compound, an Egyptian brought up in Qatar. The work’s authenticity stems not so much from Helmy’s personal familiarity with compounds, but her ability to use this particular class, conception of community and set of aesthetics as a source of an expanded imaginary. This positioning is what gives the work its relevatory and indeed its critical aspect; the manner in which the compound’s luxurious fakery is expanded into new forms and subjectivities. The compound-dwellers in Statements literally practice building through language: ‘we built by reading like this: Above a word / Above a word / Above a word / is a word [...] / cement cement cement / makes / cement cement cement.’ The dystopic possibilities are clear, but in working ‘from’ these flat, shiny, semantically poor and materially rich spaces, Helmy offers a space for speculation. The story about there being no stories is, after all, a story which can only produce more stories of its own.